The villa is situated just a short stroll from the central village square in Santorini with its pretty churches and picturesque Venetian bell towers. The village, with its winding cobbled pathways, is free of traffic. Access to the house is through imposing large wooden entrance gates into a secluded and very pretty private courtyard, with garden and a beautiful Moroccan-style swimming pool. There is also a smaller courtyard where the guests can enjoy dining al fresco under the Santorini skies whilst absorbing the village atmosphere almost within arms reach. The mansion has been beautifully renovated to provide all modern amenities, yet retaining the character and style of the original house. Double doors lead directly from the courtyard into a spacious living and dining area with superb high vaulted ceilings and original polished wooden floors. The two bedrooms lead off from either side of the central living room. One bathroom in hushed hues with modern amenities is shared between both bedrooms. The kitchen has an original stone arch which now serves as a washing up and preparation area. Modern amenities include air-conditioning in both bedrooms, free internet access, satellite TV & DVD, Ipod&Ipod docking station and a complimentary mobile phone. 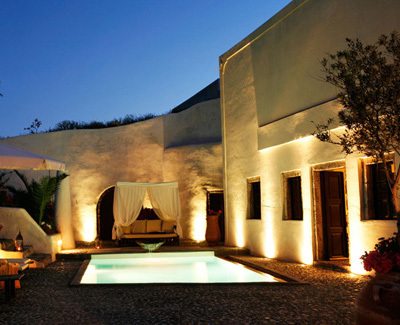 Mansion Sophia is available for rent to those who dream a perfect honeymoon or just seek absolute relaxation in a romantic environment..